I noticed this one - 60 caches in ten miles, and decided to have a go. I parked near number 48 - my plan was to do the lower section (in reverse order) because that looked mostly bikeable, and I'd be able to zoom back to the car after doing about three dozen caches; I'd also have the option of leaving the bike and doing the rest on foot, then driving to pick up the bike. So I set off. The caches were all pretty easy, although some of them have become very wet. And the track to the second and third was over loose soil, which is the worst - the bike gets clogged up and I can't even wheel it. But I managed to get across, and then I was on bridleway, on grass. The ground was very wet and soggy, but bikeable. And after that, the terrain stayed good for almost the whole trip. And I didn't have to do any heavy lifting. I got to Spaldwich at about 2pm; that was the point at which I had a decision to make about how to proceed. I decided to continue on the bike, which turned out to be a good choice. There was one more loose-earch stretch, but I'd picked up a useful stick to unclog with, and I promised the bike a thorough wash-down with the pressure washer (now that the terrible drought has ended etc etc) when we got home. The bike did its part well; I got through 2 1/2 batteries (I'd taken three with me, on the grounds that I'd probably need them). I did the last dozen or so in the gathering dark (using my head torch), and it was full dark by the time I got back to the car, at about 5pm. So the route, advertised as five hours, took me seven - I'm pretty slow at caching. I find that going slower means I fall over less. But it did mean a very late lunch. And I'm very glad I didn't use that big main road on the bike - it's the A14(T) and the traffic is fierce, and there's no bike lane. Round about number 55, I started hearing a high pitched beep, coming from the front. At first I thought, is this an error message from the bike motor I didn't know about? Or is it my phone doing something it hasn't done before. Then I came up to the source of the sound. The vertical line you can see towards the left is an antenna. The grey thing in the foreground was what was doing the beeping. 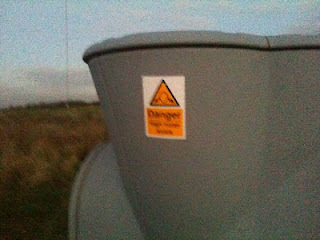 The notice says "Danger high noise levels", so I guess when it gets angry it does a bit more than the pathetic little beeps I was hearing. A total of 67 caches today, and because I was mostly on the bike, I'm not excessively exhausted. An excellent day out. Yes, I'd been wondering what it was.